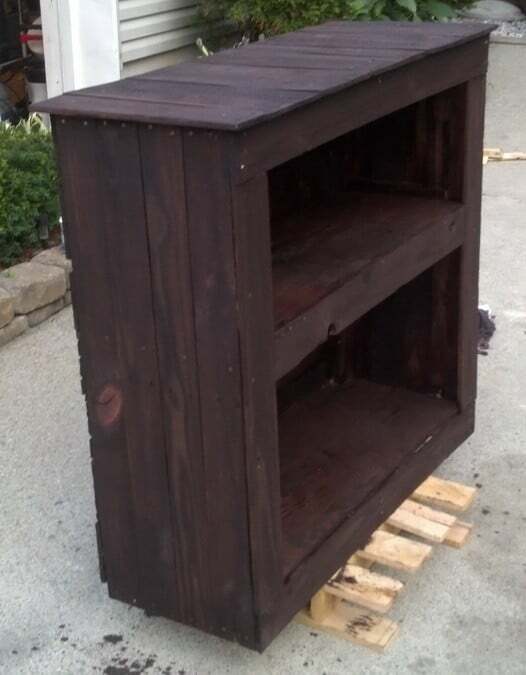 There are literally hundreds of things to make from a wooden pallet. Here is a simple way to a make a shelving cabinet shelf from 3 average sized wood pallets. 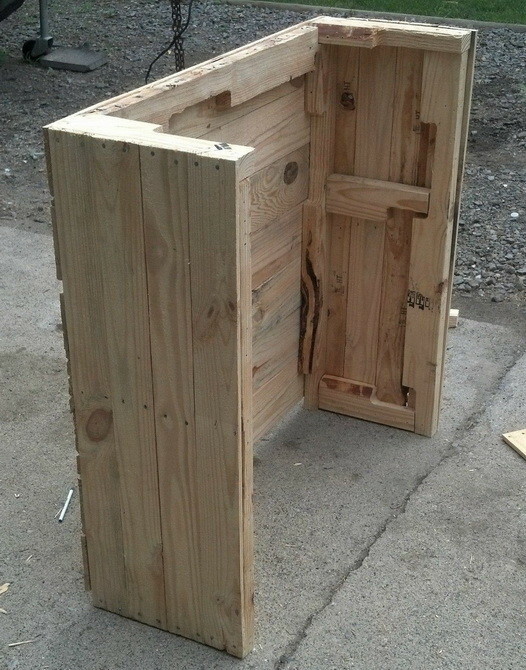 Making furniture from a wood pallet is a great way to recycle an older pallet that may be headed to the trash dump. 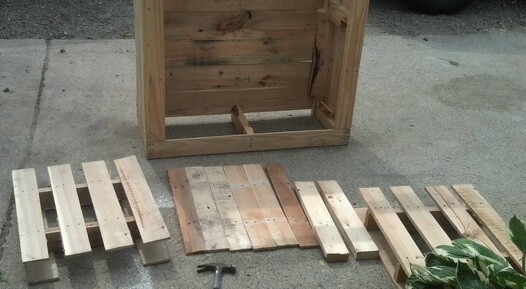 By reusing a pallet already created you are helping the environment and creating something yourself that has a purpose. Projects like this are fun and very challenging and let you use your creative side by building something unique. 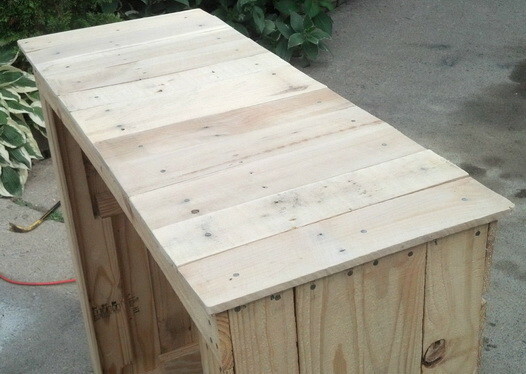 At the same time you are actually helping the landfills stay slightly emptier by recycling a pallet into some useful DIY furniture. It is a win win situation! 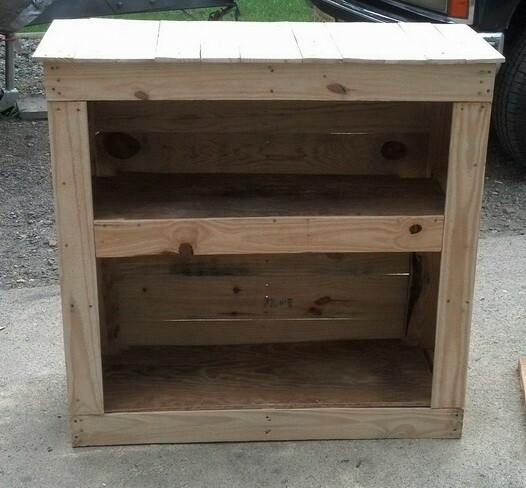 See below for our simple step by step process for turning 3 wooden pallets into a cool dresser cabinet shelf unit. We started out with 3 normal sized square pallets. We removed nails and cut the wood pallets to the proper size to fit our custom cabinet. Here we framed out the sides first. We used the thicker pieces of wood from the 3 pallets for the back of our cabinet. You can see the framing is finished and the front of our shelving unit has been assembled and attached. Here we used the 3rd pallet wood for the very top portion of our cabinet. The top of our shelf cabinet is attached and looking great. 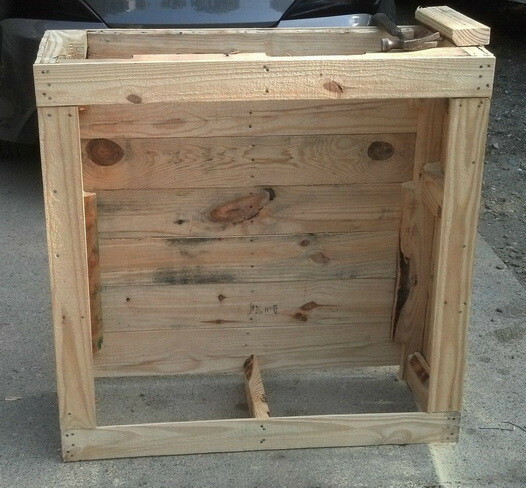 Here is a closer look at the top of our pallet cabinet. We used nails to attach everything together. You can use wood screws if you want but we were trying to recycle everything. We attached the inner shelf and the pallet cabinet is fully together. Now time to stain the wood! 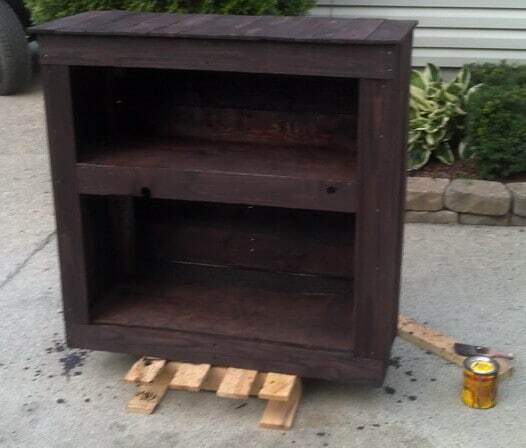 We used part of one of the pallets to elevate the cabinet so we could apply some red mahogany minwax stain. 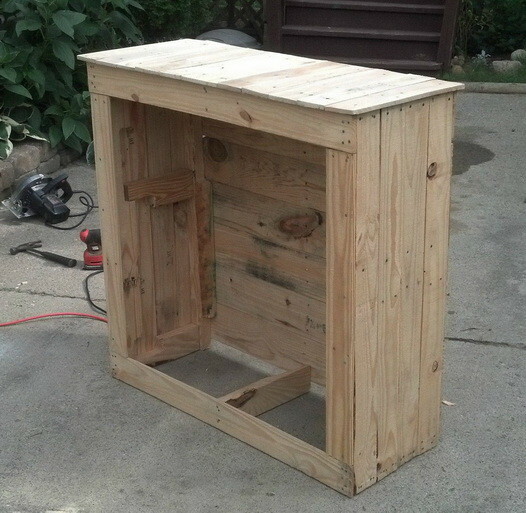 You will probably use the complete can of stain since the pallet wood is very porous. Here is our custom wood pallet cabinet shelving unit fully finished. You can use any color of stain you choose but be sure to coat the wood at least twice to get a long lasting finish. 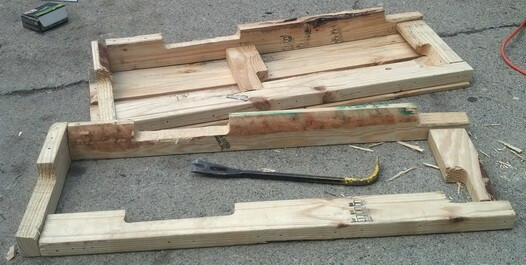 NOTE FOR SAFETY: A wood pallet is industrial use wood. You MAY have the possibility of industrial contaminates on your pallet. The best pallet to use for any project will be marked HT for heat treated. If your pallet is marked CT that means it is chemically treated and you should try and search for an HT pallet instead. With any pallet, you can remove the danger of these POSSIBLE contaminates by simply hosing the wood down with water and cleaning / scrubbing with soap. After a good cleaning leave the pallet in the sun for a full day to fully dry out. Whatever project you are going to be doing with your pallet you can seal the wood first with any common wood sealer. REMEMBER it is a good idea to act as though all pallet wood needs to be sealed than to act like there is no possibility of danger. Especially when you’re going to be storing food near it or using it in a garden environment. – Thank you for reading! Did you have to sand the pallets? How long did this take? Is it a relatively easy project? I am rather inexperienced when it comes to woodworking, but am a college student with a small bedroom in an apartment that I am sharing with my boyfriend. We do not have a lot of clothing storage, but this would be perfect for the closet. It’s hard to find something like this for cheap being sold, so I wanted to make it if it is an easy project that can be done within a month during the evenings and on some weekends.